FLOTUS here, with a story about a few guys, a few growlers, and a few hundred thousand dollars borrowed from a bank. A few years ago on a Friday night, three brothers and their dad had a great idea. "Let's fill our new Christmas growlers with a beer we've never had, then hang out in a garage in the middle of winter until the beer's all gone." They had so much fun that they decided to do it again the next weekend - and the weekend after that - and the weekend after that. They began inviting friends to come along, dubbing the night "New Beer Friday". It was a fun night to look forward to, and there was only one rule: try a beer you've never tried before. It didn't take long for New Beer Friday to become A THING. Every week, the growing number of pals gathered to drink beer, always making sure to try something different. On any given Friday, you could find 20+ people gathered in someone's home with their families in tow, sharing beer, playing cards, singing around a campfire, and enjoying the camaraderie created around the idea of trying a new beer. Eventually, the brothers and their dad had another great idea. "You know what would be the ULTIMATE New Beer? A beer that doesn't exist yet. A beer that we brew. The newest of new beers!" On that Friday, on a stovetop somewhere in Portage, Michigan, The Oatbama Stout was born. The name, a play on the oatmeal stout they were brewing, was somewhat of a fluke. A few growlers later, they joked about how funny it would be to make a whole line of beers named after presidents, tossing around names like The Grill Clinton and The Lincoln Lager. Later that night, when Jake told me about the Oatbama and the others they'd come up with during a growler-induced brainstorm session, I laughed and (jokingly) suggested they open a brewpub called The Oval Office. It was a funny thought, but I wasn't exactly...serious. Like, at all. Nevertheless, a few months later, Jake purchased a "real" homebrew system from a fellow local homebrewer, and began to experiment with recipes in our garage. He joined a homebrew club, scoured the internet for tutorials, and pored over books about the science of brewing. He even bought a fancy microscope to study yeast in the basement. There were recipe journals and malt bill spreadsheets, extensive research about hop varietals and the perfect glassware, and endless trips to Siciliano's and the Bell's General Store. The rest, as they say, is (American) history. Once the homebrew train left the station, New Beer Friday morphed into something even bigger and better than it was before. Jake built a 4-tap kegerator out of a chest freezer, and filled it with a variety of presidentially monikered brews. Once a month, folks gathered at our home to try his latest creations and hang out with other beer fans. Friends, family, coworkers, and neighbors would not only show up - but they’d invite their friends to come too. Before I knew it, there were 60-70 people showing up at my house every month to drink beer and hang out - including a handful every time that I’d never met. Jake and I sat back and marveled at the conversations that were happening around us every time. People who had just met were sharing a beer and getting to know each other. We’d watch as people with polar opposite political views spent hours chatting about what they had in common, instead of arguing about what made them different. We saw friends from church hanging out with friends who have never been to church. Corporate America playing Spikeball with 3rd shift manufacturing. City slickers talking football with country folks. Our parents and their friends playing euchre with recent college grads. Moms and dads enjoying beers and finding community with other parents as their kids made new friends too. Seasoned beer lovers explaining beer styles to newbies and guiding them toward beers they might enjoy. People who don’t even drink beer coming to hang out because the atmosphere and people were so great, they didn’t want to miss it. Each New Beer Friday was a blend of people from various social circles, many of whom didn’t know each other prior, and didn’t have much in common on the surface other than loving beer. People who showed up excited about meeting new people, having great conversations, and connecting with others - no matter how different they might be. People who weren’t afraid to strike up a conversation with the person next to them, because chances were good they’d end up talking for hours. Every time, we’d crawl into bed after the last euchre game wrapped up, and talk excitedly about the people who made a connection, the stories that were told, the beers that were shared, and the friendships that were made. I’d be lying if I told you we didn’t get emotional talking about this unique, amazing thing that had begun in our basement. 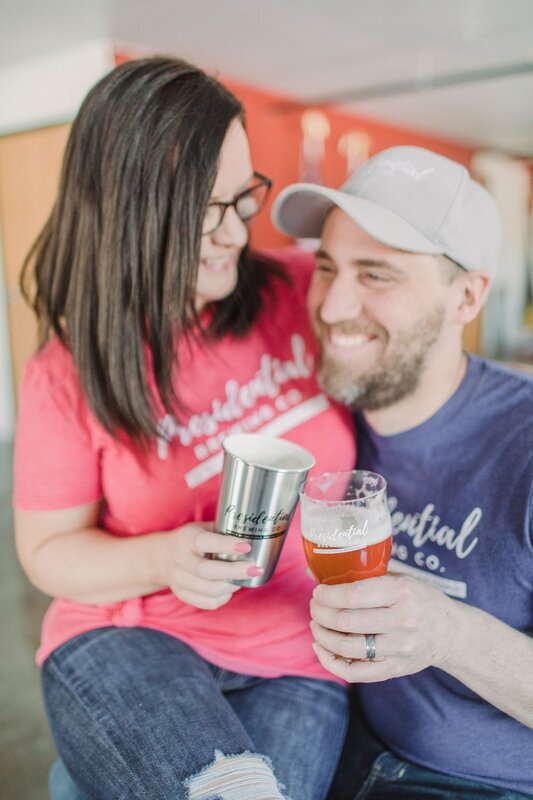 Presidential Brewing Company started out as a fluke, grew to a joke, and evolved into a persistent dream we just couldn’t shake. We love the beer, love the brewing process, and love the industry. Even more than that, though - we love the opportunity to share the New Beer Friday experience with Portage. The driving force behind our business isn’t to retire rich in a few years (lolol that’s not how breweries work, FYI), it isn’t to “just do something fun”, and it isn’t to create the biggest, coolest, trendiest, most exclusive, most amazing beers on the market. It’s to encourage people to put down their phones and talk to each other. Introduce yourself to the person sitting next to you and get to know them. Discover your new best friend because you challenged someone to a game of euchre. Find a new favorite beer because someone took the time to explain why Huma was a hard pass, but a NEIPA might change your mind about writing off IPAs altogether. Community is everything, and if we do one thing exceptionally well here, gosh darn it it’s going to be that. If you’re still reading, you deserve a beer (and maybe a Nobel Peace Prize) - thanks for hanging in there. I’ve been called many things over the years, but “brief” is not one of them. Many years after that fateful growler night, we’re the proud occupants of a building on Portage Road that will soon be home to Presidential Brewing Company. There are investors and architects and newspaper articles and Presidential t-shirts in 9 states (and counting!). We have roughly 1,500 Facebook fans and more than 100 mug club members as of right now. It’s been a wild ride, but this silly little "haha, maybe someday" dream has become a reality thanks to the incredible support and encouragement of beer lovers in this community. We’re forever grateful for our New Beer Friday family for cheering us on and cultivating this amazing tribe alongside us. For every brewery owner, brewer, and taproom staff member that welcomed us into their businesses to learn from them - with open arms and a willingness to teach, advise, and encourage us every step of the way. For the homebrew club that took in a newbie and taught him to make decent beer, then faithfully supported his dream of opening a brewpub. For every friend, family member, neighbor, coworker, and “we only met once but I’m here to help” rockstar that showed up for work days at the brewery, putting hours of grueling into this place with only pizza and All Day IPA (and our undying affection) as payment. And for every Facebook fan, website visitor, Portage Road neighbor, and community member who has shared in our excitement over the last few years as we bring this dream to life. Thank you for believing in us! We are humbled by your support and encouragement, and promise to always work hard to create a space you are proud to call home. As we continue the journey to our grand opening and beyond, we hope you'll check back often for updates on our progress. You can follow along on Facebook for live video updates and progress reports, or click the NEWS tab at the top of this page to check in on what we're up to. We can't wait to raise a glass to you in our new home. Cheers!